Hardware names are shown in picture to right. No Brand Hardware is used by many manufacturers. 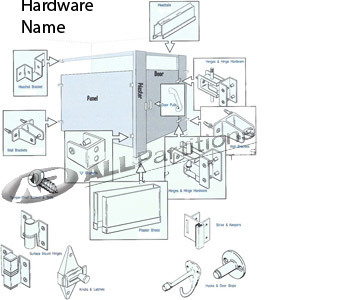 Much of the hardware you'll find in the manufacturer's sections will be found below. Federal requirements of door latches opening with a closed fist. Being able to open a locked door from outside by raising the door enough for latch to clear the keeper. Minimum 32" door opening clearance. Requirements are different for remodeling and new construction. Always check with your local building inspector for local requirements. Contact us for help to meet Federal requirements. Have 1" thick x 58" high doors and panels. Pilasters are 1 1/4" thick. Height is 80" for floor anchored/ overhead braced; 69" for floor mounted/ anchored; 83" for ceiling hung for a 8' high ceiling. Click here for design help. Send a picture if you don't see your parts below.